I created a Jam Games page in order to keep all my short form games in one location. Currently only the games that have already been hosted on here appear there but I may add more that I feel comfortable sharing and any future jam games will be located there rather than on a separate page. Check it out here or up in the navigation bar. Been a while since I've posted anything but believe me I've been busy. Hopefully I'll have something new to announce soon. Until then, I'll be in San Francisco for GDC next week. I'll be attending the Indie Game Summit and will be wandering the expo floor and attending parties the rest of the week. See you there! This postmortem was originally posted on the Ludum Dare blog, to put it in context. This was my second Ludum Dare after failing miserably (but still submitting) my first time a couple years back. Thank You Hobo was my entry, an arena shooter that really emphasized the "take this" portion of theme via the hobo swapping your weapon every 10 seconds. The tools - I recently got back into 2D game development after focusing on 3D for a very long time. I had used AS3 and Flashpunk for a couple of prototypes, but I was still worried about getting stuck on some functionality the engine might not allow me to do easily. Thankfully, I was way off. I don't think I hit one technical hurdle the whole weekend. In fact, FlashPunk saved me more work than I thought when I realized it had functionality for moving and swept collisions, something I thought I was going to have to implement myself. I told Chevy Ray on Facebook that I owed him a beer, I will probably be using FlashPunk for several more projects. GraphicsGale, which I used for the first time for this project, was also the other reason things went so smoothly. Being able to author, animate, and export assets in spritesheets quickly from one program was incredibly helpful. And of course, Ogmo Editor and SFXR were really good timesavers. The reason I am so happy about this positive is that this was the biggest negative for me the first time around. I was using my own still-in-development engine and working in 3D, so I spent most of the time dealing with plumbing and getting Maya (although I use Blender now) to do what I wanted level-wise rather than writing the game itself. The art - This was something else I was worried about that happened to work out in the end. I don't consider myself a good artist, but I've been working really hard for the last year to improve through a lot of study and practice. Most of that was on paper and pencil though and I hadn't done pixel art, much less animating it, in a very long time. Given that, I was happy with the end result and hope it's at least a step up from programmer art. Also, like I said above, GraphicsGale got out of the way for most part (although I dont like how it deals with alpha) and sped up my workflow. No stress - This may seem like a weird one but I only mention it because the first time around I found myself getting stuck on dumb stuff because I insisted on using my own incomplete tools. This led to a lot of stress and almost no time to participate in the blog posting/reading and IRC part of Ludum Dare which I think is very important to the experience. Due to the feeling of getting stuff done and not getting stumped on anything, I didn't feel bad about taking time to read and participate in the IRC channel and the blog. I was still pressed for time obviously, but was still able to keep up and even play with a couple of the games. This led to a much more enjoyable experience overall, the way LD is meant to be done in my opinion. The theme - I did make my peace with what I'm about to say, but I put it in the negative because it did cost me time. I feel that over time Ludum Dare has attracted more and more people, which is good, but along with that comes a lot of newer game developers that tend to shy away from the more narrow and challenging themes. This has led to a lot of generic themes getting voted on and winning most of the time ("Enemies as weapons" was the only recent exception) which I think affects things negatively for two reasons. First, the personal reason that probably others share: I tend to come up with better ideas faster with a good thematic constraint. Themes like this one are very vague and apply to almost any game, so it's very difficult to come up with a game from the set of every game imaginable. I ended up wasting 3 or so hours because I couldn't come up with an idea I was happy with and I do think that I settled because I didn't want to devote any more time to brainstorming. The second reason, which sounds superficial but it's still important, is that the games don't tie together very well at the end. The theme isn't obvious when you play all of the games like it is with themes like "Advancing Wall of Doom". Regardless, I don't think I will ragequit Ludum Dares because of generic themes. The experience of getting a game done in 48 hours and participating in the community far outweighs bad themes. Cutting features - This happens to everybody obviously due to the time constraint, but I think my game would have been more interesting with varied zombie types as I originally described it. I would have also prefered more weapons to get done from my list, but I'm surprised I got through as many as I did. There was also a few larger art assets I wanted to work on to vary the environment but I decided to improve a couple that were in there already instead with the little time I had at the end. I also didn't have time for music, but I predicted that in my intent-to-join blog post. Regardless, I'm still bummed about that because I think music is very important to most games. The bright side of this is that I have a pretty clear set of things to add or change if I work on the game post-compo, which I probably will at some point this year. Overall, this LD was a far more positive experience. I can't wait for the next one! I will probably be getting very little sleep this weekend as I am planning on participating in Ludum Dare for the second time. Ludum Dareis a semi-annual 48-hour competition, kind of like a marathon for game development, where you make a game from beginning to end in one weekend. Last time I participated I didnt quite finish since I fool heartedly decided to make a 3D game, but it was still a lot of fun. This time around I will be working with Flashpunk, pixel art, and other timesavers. Ludum Dare was founded by Geoff Howland, and held it’s first competition in April of 2002. Since then the community has run more than 18 regular Events, dozens of practice competitions, collectively creating thousands of games in just a weekend each. The event attracts developers from all sides of the industry. Students, hobbyists, industry professionals from many well respected game studios, as well as many independent game developers. For many people, it can be difficult to find or make the time create a game or prototype for yourself. We’re here to be your excuse. The Ludum Dare competition and website are currently maintained by Mike Kasprzak(PoV) acting as figurehead, and Phil Hassey(philhassey) handling most of the site administration and programming. I'll be blogging progress on the compo site, be sure to look for my name on there throughout the weekend. I'll most likely be writing another blog post on it after its over as well. Wish me luck! Before answering the question, we need to define what being original means. Many argue that true originality is extremely rare and even non-existent, since every work can be traced back to some previous work either because it builds upon some style or solely because of the artist's inspirations or influences. What is a lot more common in games is innovating by introducing some unique mechanic to familiar gameplay or new takes (through visuals or gameplay) on existing genres. If a particular innovation is interesting enough, it can make an otherwise derivative game original in the eyes of players and critics. My definition is closer to this than the almost fatalistic "originality doesn't exist" definition. This is Infiniminer. If memory serves me correct, the game was mainly multiplayer and focused on digging through a massive mine made out of these cubes that represented dirt, stone, and other materials. You looked for certain minerals and brought them to the surface for your team. 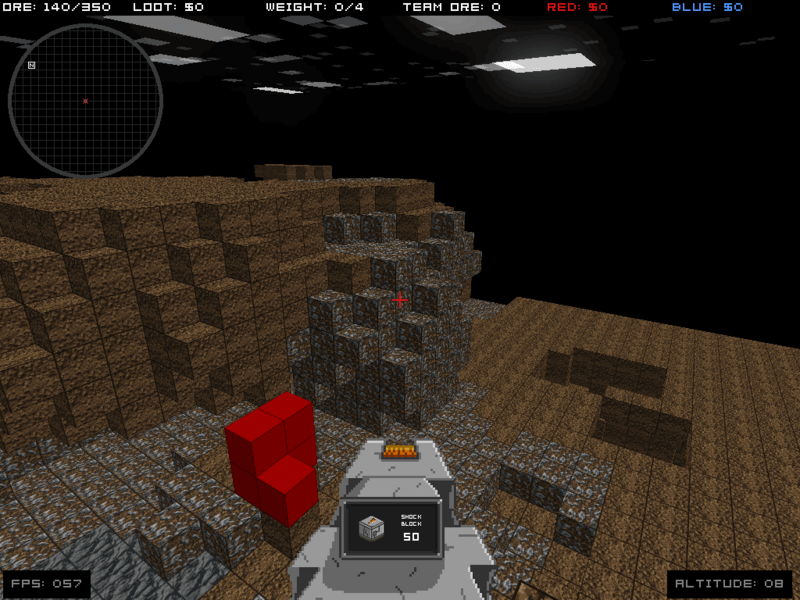 At the same time (around mid-2009), Notch was working on an open-ended game in the same vein as Dwarf Fortress with a focus on 3D graphics. It's well known and cited by Notch himself that Infiniminer was the main influence for Minecraft's visual style and the mining aspect of the game. However, few will argue that Minecraft was a carbon copy of Infiniminer and furthermore few will disagree if you say that Minecraft is a novel game, and rightfully so. But is it truly original? If we accept that nothing is original and use our loosened definition then the answer is yes. If it wasn't an original and unique experience then it wouldn't have been as successful as it is, no other game provided this experience at the time so if it's something that appealed to you then you HAD to buy Minecraft. What about this game? Man, Minecraft got a nice visual upgrade right? Wrong. This is a game called FortressCraft that was released on XBLIG mid-April. While it does have some very nice visuals, avatar support and tries to add new items, it's pretty much a clone of the basic gameplay of Minecraft. Does this mean that anyone that releases a game with large voxel based dynamic terrain is just ripping off Minecraft? Absolutely not. Take a game like Ace of Spades that combines such terrain with Battlefield style gameplay. I'm not gonna lie, I still think there's a lot of capitalizing on Minecraft's success, but at least this game is doing something fun and different with the game world. But do you recognize this one? Obviously the first one is Angry Birds and the second screenshot is from an earlier game called Crush the Castle, the reason I stayed away from Angry Birds for such a long time. I had played this game and loved it and was devastated when I saw it blatantly ripped off (in my eyes at the time) with the people copying the game getting filthy rich. If you haven't played it but have played Angry Birds, the people are the pigs and the stones are the different bird types. Other than that, it's pretty much the exact same game. It wouldn't have been so bad if I didn't see so many blogs calling it an Angry Birds alternative or even worse, misinformed review comments (for the Android version) saying it was an ugly Angry Birds ripoff. I am not a stubborn person though, so after buying an iPad 2 I finally gave Angry Birds a chance. I was wrong. While the core gameplay is still 100% lifted, the game still felt so unique. How is that even possible? I still feel dirty playing it but it's a perfect example of the grey area of originality. The game just oozes character through its polished and playful visuals and sound along with the cutscenes that bring everything to life. In short, it speaks the language of video games (and I hope Craig Adams doesn't kill me for relating his incredible article to Angry Birds). Unique presentation as innovation. It's not one of my favorite games, but now I understood part of why it spoke to so many people and hooked them. I won't dwell on this example, but a similar case can be made for the hit iPhone game Tiny Wings and the lesser known game that was the obvious inspiration, Wavespark. Getting back to answering the question posed by the title of this blog entry, there's an easy response if you listen to the cash register: No. Whether you consider the above avian example an original game or not, the insane amount of money it has raked in makes this answer painfully clear. FortressCraft made $100k in 4 days, an amount that is widely known as the highest only a handful of XBLIG games have grossed in their lifetime. Made in one weekend. Most of these gamers must have heard of Minecraft. They must have known this game was a carbon copy. They obviously didn't care, they wanted a Minecraft experience on their Xbox and rewarded the developers for ripping it off. This is a very grim conclusion but fortunately most indie developers I know, including myself, aren't in it solely for the money. Despite what most will say though, money is still important especially for full time indies. However, artistic merit, expression, or just making something fun seem to be the primary motivators for most. In this case, the answer to our question is a resounding YES. This was neatly wrapped up and tied with a bow at the GDC 2001 Indie Games Summit rapid-fire talks by one of the speakers (I forget which one, someone remind me and I'll credit him). The idea is that there is there are two approaches revolving around motivators for making games, a. making something honest or unique or b. making something to cash in on some trend. With approach b. you will either make a ton of cash or make nothing. With approach a. you can potentially make SOME money but at the same time will likely earn some recognition. Whether that recognition is an IGF award or some blog mentions doesn't matter, you will gain some notoriety that will grow your audience for your next game which will also potentially make some more money and/or give you even more recognition. Of course, the result for the honest approach assumes you succeed in creating an interesting and unique game with some attention to presentation and polish. To me, that approach seems much less riskier and while it's not as likely to make you rich overnight, at least you keep your dignity and can be proud that your work truly represents you. As a final answer to "Does originality matter? ", it really depends on your motivations and who you ask. The customer doesn't care for the most part. The money-hungry-games-are-a-business-get-rich-quick guys will say no. The game maker that truly cares about their legacy and their work will likely answer yes. This response is more likely for the designer that sees games as an artistic medium, it'd be difficult to see that person settle for the game equivalent of landscape paintings that end up on hotel walls. But with originality being so subjective, maybe it's more reasonable to strive for honesty. Even while heavily inspired by other games or a specific type of game, some truly great things come out of developers that are just plain honest in their work. It'd difficult to be completely unoriginal when you love your work and take pride in it. Please share your opinion on this subject with me in the comments section or on Twitter (@chrisz).